A blog is essentially a website formatted to display the most recent content on the top page. With a few steps, you can transform your blog into a simple but conventional website with an anchored or static home page that won’t flip around when new pages are added. Here are the steps that I’ve found work but for more details, you can check the WordPress Support page: Using WordPress to Create a Website and other WordPress support sections. 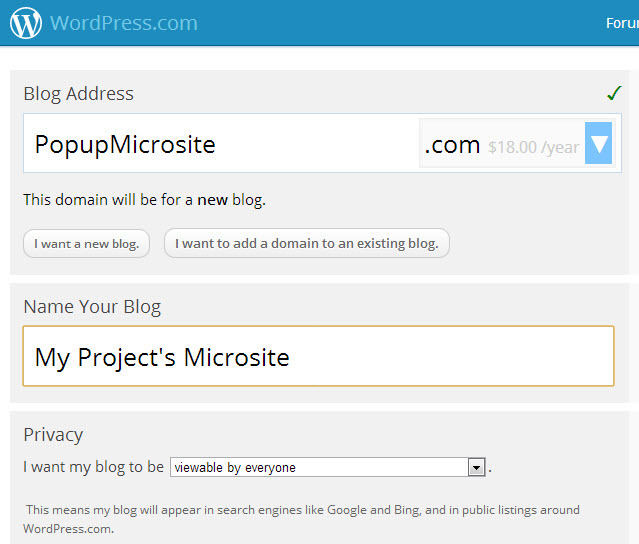 Create URL – Go to the WordPress Getting Started page to register your site. To make your site easy to find with a standard URL, you can register it with a vanity URL (for an annual cost that’s much less than a tank of gas) or you can leave the standard free blogname.wordpress.com URL. Enter your General setting preferences setting on this page — from your site title and sub-title or tagline to your preferred language. Create and Anchor Home Page – Go to the Dashboard (left side panel) and Set up a static home page by following these steps. The theme comes with a default photo that you’ll likely want to change. Format a photo to the exact pixel dimensions, upload it, crop and click Save Changes. Click your site’s name (top left corner of screen) to display it and repeat until you have the ideal look. Go to the Dashboard and select: Pages > Add New. Type a title for your page (top field). Click Screen Options (top right) and deselect “blog-like” attributes, such as “Likes and Shares,” and select “1 column”. Click the Publish button (bottom right). Click to select the boxes to the left of your page names (lower left corner), including the Home page. Click Add to Menu and the pages will be depicted as boxes in the top right of the screen. To add your main website’s URL (as politically, it’s often a good thing to do), go to the Custom Links section (at left) and type in your main site’s URL and name it in the Label field. Click Add to Menu. Shuffle the page “boxes” in the menu area (top right) to get the desired order and manually move them in to create sub-menu pages, if desired. Check Custom Menus page for more details. Update: One of the disadvantages of using WordPress.com as a website platform is it is not directly compatible with Google Analytics, which is a valuable measurement tool. However, I recently discovered a cost-effective workaround using CloudFare, which Jonathon Balogh outlined in this post: How to Use Google Analytics on a WordPress.com Blog. And it worked!